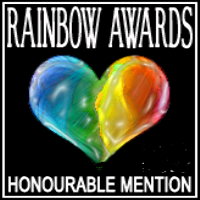 "I'm glad to announce you are among the finalists or honourable mentions of 2011 Rainbow Awards. Best Gay Contemporary General Fiction." I'm shocked, thrilled, and dancing with glee...which could be dangerous for a woman my age. Thanks to Elisa Rolle and her team of judges. This had to be a grueling undertaking. I'd also like to congratulate all the winners. What a year! I saw many names I knew and have added countless books to my TBR pile, thanks to this effort. Elisa's support and the Rainbow Awards do so much to help promote the genre we love. Thanks again, Elisa. Thanks! So unexpected, but so very appreciated!